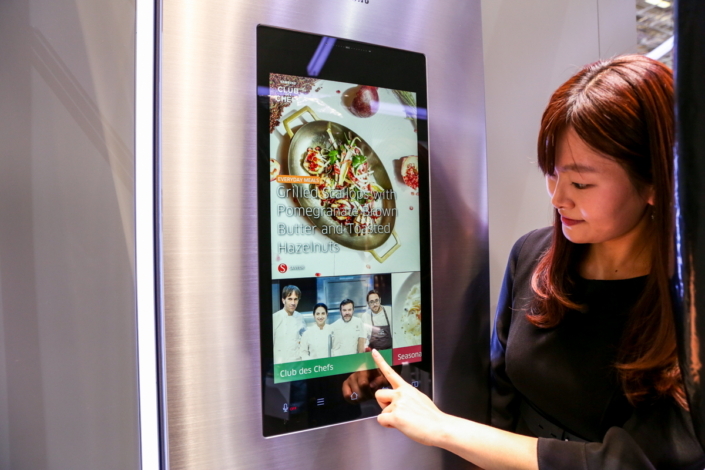 Featuring a large touchscreen display and a comprehensive suite of intuitive apps, Samsung’s Family Hub refrigerator brings the timeless art of cooking well and truly into the twenty-first century. The latest edition, designed for European consumers, allows more people to take control of their kitchen, with tools to streamline not only cooking but also food management, communication and even entertainment. Transforming how European families use their most important appliance, and helping them eat, and live, smarter. Cooking a delicious meal doesn’t have to be a chore. Apps like Allrecipes, as well as localized apps like Whisk and CHEFKOCH.DE, offer users the blueprints to craft some of the world’s tastiest foods from the comfort of their kitchen. Some of the world’s greatest dishes are staples of European cuisine, and some of its greatest chefs are members of Samsung’s Club des Chefs. Family Hub’s Club des Chefs app offers users unbridled access to the masters’ wealth of culinary expertise, with recipes, detailed “How to” articles and accompanying video walkthroughs. So users can watch and learn, and enjoy great food. Family Hub was designed to not only help families prepare delicious meals, but to also give them more insight into the freshness of their food. With Family Hub’s three inner-view cameras, users can peek into the inside of their refrigerator without opening the door, and even when they’re not in the kitchen. That camera functionality, along with Family Hub’s dedicated smartphone app, allows users to shop smarter by staying on top of their refrigerator’s contents when they’re at the store. Providing the intel to help them stop forgetting the milk once and for all. East to west, Austria to Zanzibar, one thing that’s truly universal is the value of family. Family Hub’s collaborative notetaking, photo and calendar functions allow it to serve as a touchpoint for families to share and keep in touch conveniently. Got an event? Add it to the family calendar. Got something to say? That’s what the Whiteboard and Sticki app are for. Family Hub’s suite of entertainment functions offers users the ability to add a soundtrack to their sautéing. With Tune-in, they can listen to their favorite radio station, enjoy personal playlists and access a catalog of over 10,000 music, sport and talk channels from around the world. When it comes to football, Europe is in a league of its own. And with Family Hub’s TV mirroring function, users can quickly and easily keep an eye on the big match, or their favorite TV programs, while they cook.